It is so hard to believe that we have come upon graduation time! I look at the ones graduating and wonder where in the world time has gone. I know it is a normal order of things and that it happens every year, but with every year it makes me feel just a bit older. Vicki and I have two grandchildren graduating from High School this year. Caitlyn is graduating from Norman North and will be attending TCU in the fall. Scout is graduating from River Road and will be attending SWOSU where she will be playing basketball. I am sitting down to begin this article and Vicki is working away in the Fellowship Hall getting ready for our High School Senior reception. We have three graduating from Pampa and it doesn’t seem possible. Jennifer, Jacob and Desi are all preparing to move forward in their lives. I can still remember the time when one of them was born and her Dad and Mom were so excited. I am excited for them as they begin this new part of their journey in life. I know that everything they face will not be easy, but I also know that their parents and loved ones will be there to support and encourage them along the way. Graduation is a point in one’s life that moves them from where they have been to another point. It is really exciting for them and yet as always it places them in a position where they will have to make decisions that will impact the rest of their lives. I know that all the graduates will each move in a little different direction. Some will go on to college, some will go to work and some will even be getting married. It will place them on a road that will take them to places they could have only imagined a few years ago. As I think about this time of graduation, I can only think of the graduation day that will take us from this life to the next. This past week we placed my mother in hospice. Her struggles continue and we just felt that hospice will provide her with the care she needs at this time. Yet Mom has been preparing for her graduation day ever since she accepted Jesus into her heart. She has been ‘diligent to present herself approved to God as a workman who does not need to be ashamed, handling accurately the word of truth.’ (2 Tim. 2:15). She has been preparing for the graduation day that will place her in the presence of the One who has always loved her. Even though her struggle in recent days has been difficult, she continues to hold to the truth that she will be graduating from this place she has called to home to her new home. When Jesus said, “…I will come again, and receive you to Myself;…’ He was talking about our graduation day. All who know Christ as their Savior and Lord; it is truly a time of great joy. It may not be joyful for us, but it definitely is for them. Just as a person has to stay in school to graduate, a person must remain in the arms of God to ‘graduate’ into His presence. 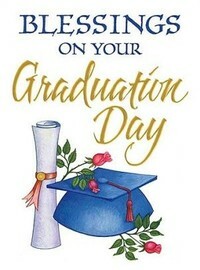 Graduation day will come for every person, but the question is will you graduate into the presence of God?